Few meals in recent memory have left me as frustrated and angry. 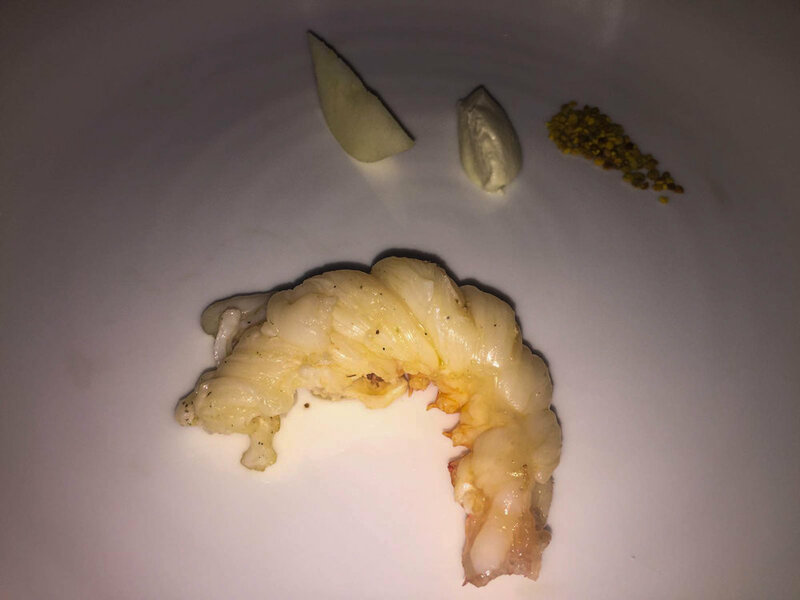 I was disappointed because we had ordered the menu degustation and had a succession of 12 courses before cheese, and I do not recall any Michelin three star meal that left me so baffled because of inconsistencies. I was also angry because we had had an excellent “bouillabaisse” meal at Le Petit Nice not too long ago (see my previous review here). Chef Gérald Passédat had taken a time tested classic of French cuisine, not to claim a dish concocted spontaneously by frugal fishermen all along the Mediterranean coast, a pedestrian “fish soup”, to culinaryheights by retaining its substantive flavors, while creating a more focused, clean, and harmonious symphony of tastes. Clearly his achievement was the result of step by step conceptualization and painstaking experimentation, and the end product looked simple and natural. There is a long history behind this dish. We have the image of a benevolent aunt smiling upon us (why not a grandma?). The chef holds a secret which is total mystery, pays nod to the poor fisherman (who is probably quite a wealthy owner of many fishing boats), and we know that he handled the fish gently while retaining texture and intensity. We are overwhelmed by all of this. There is no cliché left untold and all that is left for us is to marvel and feel good and privileged. Except, there is one problem, which is that we did not feel good, save for the cheese platter, a few amuses and a couple of dishes, and, a great wine. The most upsetting problem was that the chef cooked all of the fish at a very low temperature and a long time in the steam oven, mimicking sous vide. As a consequence, the texture of different fish, such as loup (seabass), daurade (seabream) and rouget (red snapper) all became mushy. It did not anymore matter who caught the fish and how it was caught. This parody reached its apogee with “le rouget de roche” (rock red mullet) as this is a highly prized fish due to its texture reminiscent of lobster. Passédat turned it into its opposite, i.e. very soft, an almost mushy texture, without juiciness and texture, under the pretext of rendering it “soft” and “subtle”. One suspects that Passédat's preference for this type of cooking style stems from the fact that it is easier, does not require close surveillance, and can be performed in an automatic way by the trainees when he is away from the kitchen. But one pays a high price for this choice by losing the “specificity” of distinct products, whose characteristics are not revealed, but masked, by the techniques utilized. The resulting absence of respect for the nature of the product was aggravated by repeated reliance of what the chef considers the “umami” taste which popped up alongside the main dishes in different guises, such as infusions, compotes, purees, a second version of the main ingredient a la Gagnaire, etc. Dashi-like infusions and various forms of seaweed and other sea plants may be marvelous when used sparingly and carefully. Alternatively, when they are overused or when they reflect a desire to be trendy (without the serious study of Japanese cuisine), they may tire and numb the palate. Overall, we felt that the many separate components of a course, often served in separate plates or cups, at best dazzled the eye, but failed to unify the dish. Worse still, the simultaneous use of multiple ingredients and components of a course was geared to maximize color, fragrance, and aesthetic pleasure. But this was like a pyrrhic victory, achieved at the expense of compromising the purity and naturally ethereal and intense flavors of pristine quality fish and crustaceans. This is too bad, since the setting is magnificent, the sound of the waves enchanting, the service professional without being too formal, and the wine list fairly priced with some gems. The first amuse, confit of palamut (bonito) with salt, olive oil, aubergine puree in a rich meaty broth was fine, if a bit too rich in the beginning of the meal. The second amuse consisted of an experiment in texture that had gone awry. What was called “souffle of octopus”, presented theatrically on sand, stones, with a seashell, looked like crisp bacon, but tasted like non-chewable caoutchouk rubber. It was served with a refreshing broth on the side. The third amuse had two parts: filet of mackerel flavored by sumac, mint, basil and coriander; raw seabass with tomato, pastis and olive oil. I found the spices overwhelming for pristine quality fat sardines, especially the use of one of my favorite spices, sumac, which did not cut the fat, but overwhelmed the flavor. Similarly the broth was too strong for the delicate sea bass. The first course was very good. Various red colored rock fishes, like chapon, rascasse and saran, served raw, were cut just the right width to retain their flavors. 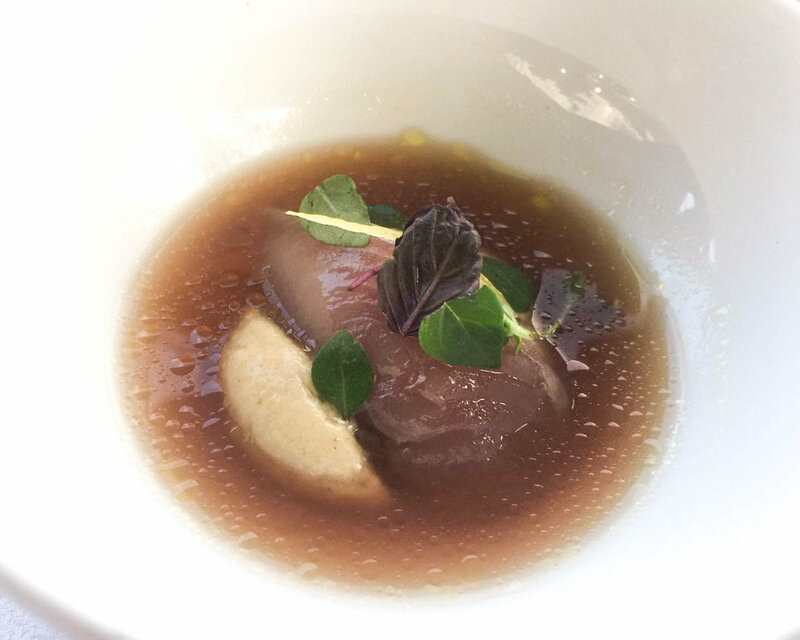 Various sea plants with iodized and grassy nuances interacted well with the fish, and the seaweed consommé served on the side and flavored with gelatinous fish skin bouillon complemented the rest of the intense but balanced flavors. The next course, called “La Caravane,” was a symphony of harmony which titillated the taste buds, as much it pleased the eye. Dollops of fine Aquitaine caviar and thinly sliced excellent pressed gray mullet eggs (poutargue) added not only salty notes but also depth to squeaky fresh and sweet seabream (daurade) tartare. The fish extraction, cauliflower purée with fish stock was not overdone and the cauliflower added freshness. Following a very good dish and a masterpiece, we were ready to forget some unnecessarily complex dishes and the disastrous octopus chip at the outset. But unfortunately our hopes were dimmed by the sea bass course. We then started to lose hope with the sea bream course, and became depressed with the rock red mullet (le rouget de roche) course. The major problem was, of course, the very slow and long steaming in a sophisticated oven that mimicked sous vide which rendered the texture of the different fishes mushy. Soft, flakey, fat, gelatinous… There are various components in non-farmed fish, and depending on when, where, and the depth that they were hunted and what they ate, there are infinite variations and nuances in taste. The cooking, especially when one is as lucky as Passédat to charge the prices he wants and to be able to buy premium fish at pristine conditions, should respect the variations inherent in nature, rather than rendering such variations into a monolith by the non-reflective application of modern technology. A related problem is that, perhaps driven by a drive to be different, and to live up to the misguided standards of Michelin that prizes the application of sophisticated and novel techniques to products, rather than product quality and harmonious combinations, Passédat made these three courses overly complicated. A great chef makes something that is complex look simple, not the opposite. In Petit Nice we were bombarded by too many spices, plants, broths, veloutes, heavy extractions, even a slice of muted tuber melanosporum, and many more ingredients, in the successive dishes, but we failed to see a binding element that unified these courses. In the rouget dish, for example, there is a side dish of rouget tartare in a very strong bouillabaisse-like rouget liver and pistachio purée, with a fish chip on top. We then had a salad-like concoction of tomato jelly, daikon radish, bay leaf, with a vanilla infusion. The rouget itself sat in a pool of clear but heavily aromatized infusion with anise (pastis), rouget skin extraction and coriander. Such fireworks, presented simultaneously around an ingredient or theme, mostly work at Gagnaire, but not here. At Passédat fireworks were coming from all directions in a haphazard way as if this talented chef did not trust his own taste and was cooking to cater to a misguided image of the “sophisticated international gourmet” who is looking for something “innovative,” “different,” with the obligatory nod to the Western conception of Japan and with a salute to the Nordic trends. Eclectic it is, but not well integrated together, with respect for the quality of the products. The last three savory courses were not on par with the amuses, but two out of three were quite good. The first one was a preparation of anemone. One sees nowadays l’anemone or sea anemone in starred restaurant menus, but personally I still don’t have a good grasp of how it tastes and what to expect. Passédat presented the anemones in deep fried versions: shaped like a beignet or croquette and like a donut. They were accompanied by an emerald green dipping sauce. One sauce was flavored with seaweed, spinach, garlic, and had a seaweed crisp on top of the beignet. The dipping puree/sauce with the donut featured a puree of anemone, garlic, coriander and candied lemon. The sea anemone taste reminded me of lobster tomalley, as it was soft and creamy, but less intense than tomalley. The deep frying was very successful, crisp, with a thin batter. These two plates were fun, and we liked them. We had perhaps expected too much from the langouste when they presented us with different courses a live langouste at the outset of the meal. I have very fond memories of grilled Mediterranean spiny lobster presented with a sauce of olive oil, lemon, parsley and lobster roe. Passédat's version was minimalist and different parts of the dish did not seem to come together. A small piece sat in the middle of the plate, with a little pear, pear puree, and almonds on the side. There were also two side dishes, one with cucumber jelly and pear and the other with a bouillon of a flower. The lobster slice was tiny in proportion to the side dishes. I also could not figure out the logic of the different components. Pear, especially caramelized pear, may work well with game (meat), but it is pairing with lobster seemed haphazard. I also became suspicious that the spiny lobster which was alive when they brought it to our table in the beginning of the meal was used to serve multiple tables. The next dish was better, which was langoustine, served in two courses. The first had a piece on a volcanic black stone surrounded with green salicornia. 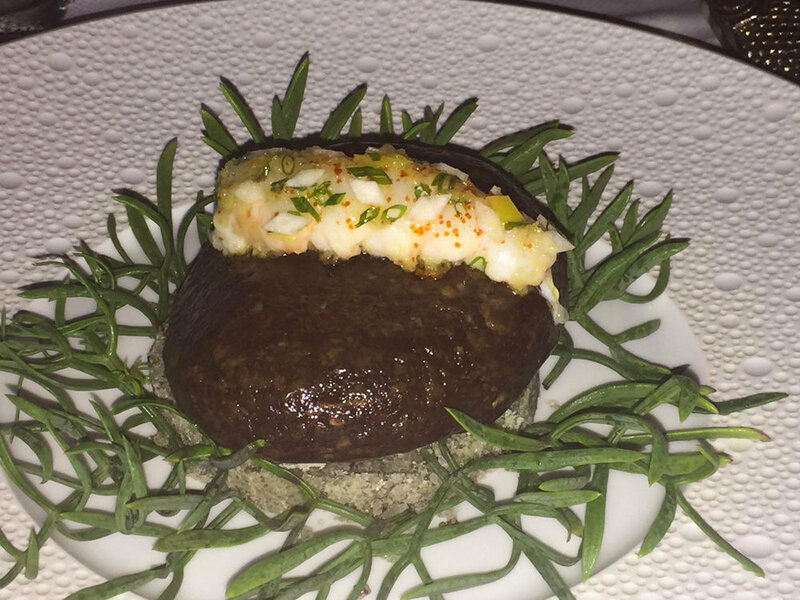 The waiter told us that it was cooked on the rock with a “cloud” (sabayon) of lobster head spread on it. I could not understand how a sabayon of lobster head tastes. The langoustine was juicy and sweet, as it should be. Finally we had a consommé of langoustine, de-shelled clams and mussels, in a very rich broth flavored with garum, a fermented fish sauce and salicornia to enliven it. The cheese selection was worthy of three stars, but we were not too satisfied with the first dessert, called “Souplesse”. It featured nice lemon rolls and sweetened peach, but lacked depth and intensity. The second dessert, “Corsican Brousse,” was a light cheesecake that blended well with the strawberry sorbet and a compote. However, the strawberries were not very ripe and did not burst with flavor, as they should in summer. The accompanying praline of sunflower topped by pumpkin seeds was nice. 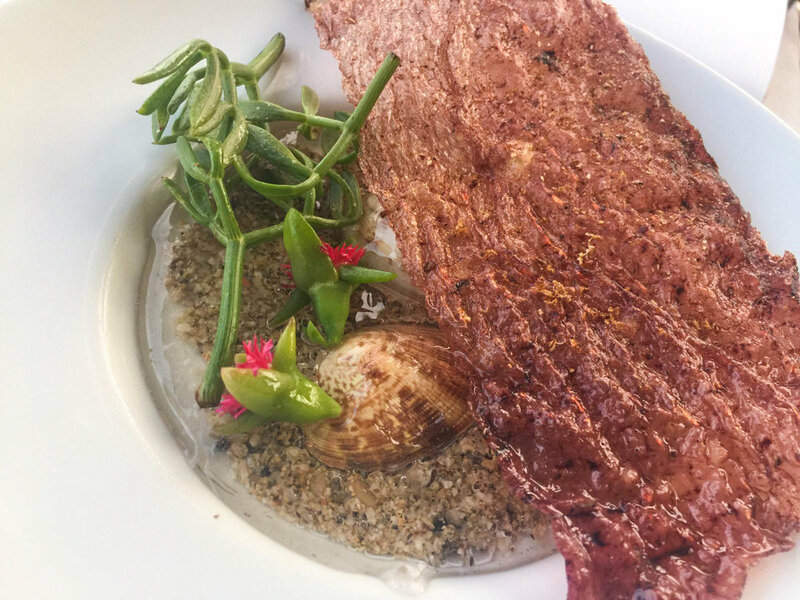 In the end we could figure out neither the logic of the progression of the meal and nor as to why a chef we liked very much has opted for show over gustatory pleasure.